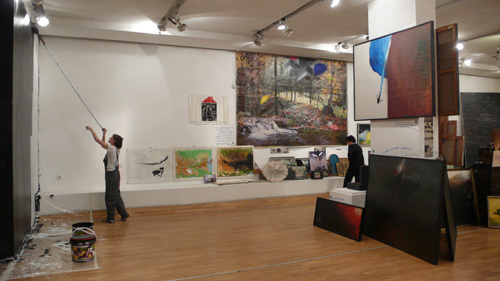 View of “Nedko Solakov,” 2009. Encompassing three decades of his work, Nedko Solakov’s retrospective at the Sofia Art Gallery is his first large-scale exhibition in Bulgaria since 1988. Curated by Iara Boubnova and Maria Vassileva, the exhibition is arranged in chronological order, with each year of his production––from 1981 to present––noted on a board. The show begins with a selection of Solakov’s early oil paintings, which brought him acclaim in the 1980s. Some of these are gathered in groups, are displayed on the floor, lean against the gallery’s plinths, or are installed on the columns. This unconventional arrangement introduces a momentum to the spatial layout and allows the visitor to clearly understand the evolution from Solakov’s figurative paintings to his installations and videos, which underscore his deft ability to compose complex and extremely detailed stories. The genius of this retrospective lies in the way it creates a narrative thread that journeys through the development of Solakov’s works, so that the exhibition appears as a new work itself. In the style of many of his hand-annotated works, such as his ongoing “Wallpapers” series––of which there are three in the exhibition, from 1993, 1995, and 2002––Solakov has added a written commentary of short penned texts on the plinths, on walls, on the floor, and next to works throughout the show. The viewer is in effect led through the exhibition by Solakov, but unlike didactic gallery labels, this commentary is not descriptive; instead, it appears as an element of the works on display and as an added layer that functions as the retrospective’s own narrative. Also framing the entire presentation is a rendition of Solakov’s 1998 work A Life (Black & White), wherein two painters––one making the walls black and the other following to return them to white––work for one month at opposite sides of the gallery. This perpetually changing yet rhythmically repeating backdrop animates the space and transforms the presentation of Solakov’s linear biography into a web of shifting narratives, which, in turn, like many of his works, propose a more complex and cyclic chronology.